Last week, my wife and I met some college friends at Corks, a restaurant in the Federal Hill neighborhood of Baltimore, MD. It had been quite some time since we’d been to Corks, the last time was for Baltimore’s 2007 Restaurant Week, because it’s not very often that we go into Baltimore for dinner. Back then, I hadn’t developed a liking for Scotch so I didn’t really keep an eye out for what they had available. This time, armed with a little more experience, I spied several well known bottles on the shelf. They had your basic bar standards, Glenlivet 12 and a Glenfiddich, as well as a Macallan Fine Oak 17 that looked appealing. However, tonight I was in the mood for something with a little more punch and noticed they had a fairly healthy bottle of Laphroaig Quarter Cask. Laphroaig is an Islay, which is generally characterized by a peatiness and smokiness completely absent from Speyside scotches like Glenlivet, Glenfiddich, and Macallan. What’s special about the quarter cask? The story they tell is that when whisky was transported by mules or packhorses, a barrel was too heavy so they used quarter casks. In those smaller casks, the whisky would continue to mature and be in greater contact with the oak – imparting more of the wood’s flavor into the dram. How much more? It’s 30% more contact, by their calculations. To help maximize the flavor, they decided to bottle the quarter cask at 48 percent alcohol by volume, up from the standard 40 percent. Besides the additional maturation, higher alcohol by volume, the whisky is not chill filtered because it hadn’t been invented back when pack animals were used to transport the whisky! Nose: Slight peatyness, smooth, velvety, coconut, creamy aroma with water. When I enjoyed it, the peatyness and smoke were very evident. I think this has more to do with my own whisky experience, I enjoy mostly Speysides at home (a problem I must remedy in my next trip to the store), and less an indication of how strong those flavors are in Laphroaig. Also, there was a slight medicinal nose that persisted the entire dram. On the palate, it wasn’t as sweet and dry fruity as Speysides, those flavors likely dominated by the peat. I didn’t get any coconut, as the notes say, but the finish did hint of oranges once the heat of the higher ABV subsided. I’d love to get this and the 10 year old Laphroaig side by side for a real comparison. 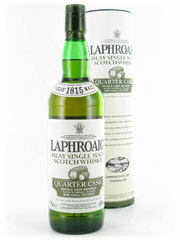 This entry was posted in Tasting Notes and tagged Laphroaig, Laphroaig Quarter Cask by Jim. Bookmark the permalink. Laphroaig is a fantastic dram, peaty and smoky but not as much punch as an Ardbeg. I can drink it all night! Laphroaig is one of my all time favorites. I used to smoke cigars here and there, so I like a peaty, intense whisky. I like nearly everything from Islay, esp. Laphroaig, Ardbeg and Port Ellen. I also really enjoy Highland Park. If you like the Laphroaig above, you should also try the Ardbeg Uigeadail.